The Nex-Tech Wireless athlete of the month from Western Kansas is Scott Community High School junior track and field athlete, Wyatt Hayes. 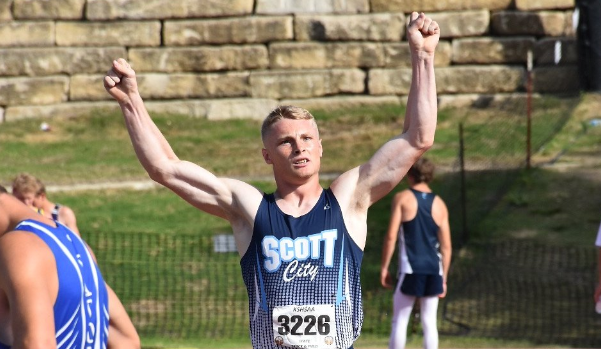 Hayes helped Scott City to two 3A first place relay finishes at the state outdoor track and field meet in the 4x800 and 4x440. He also added an individual title in the 800 meter run. Hayes is a rare combo that is a state wrestling champion, all-state defensive end/fullback that is also a mid-distance runner. Hayes individual title came by winning the title by 1/100th of a second in a time of 2:00.02, edging Matt Goeckel of Council Grove (2:00.03). Hayes will also be one of the top returning football players and wrestlers this upcoming school year in 2018-2019. Nex-Tech Wireless would like to congratulate Hayes and the Scott Community High School Beavers on the 2018 3A State Track and Field Team Title.